Here comes a handy recipe to prepare at weekends for egg lovers. 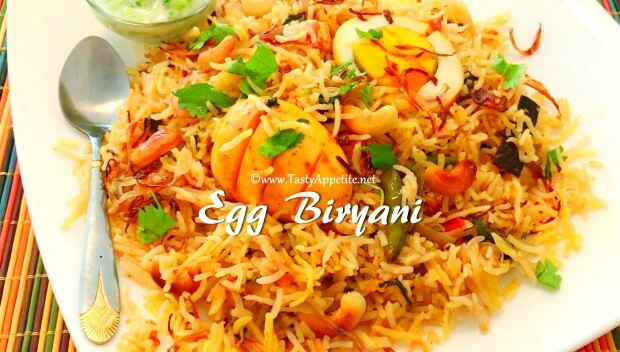 Egg biryani is one of the quick, flavorful & delicious biryani that can be prepared at home easily. This classic recipe is one of the signature dish of my mom and has amazing irresistable flavors. It makes a great treat for sunday meals. Check out this easy video recipe and enjoy the smiles of your loved ones! Wash & soak basmati rice in water for 5 mins. Drain water and set aside. In a small cup, add saffrons and 3 tbsp of milk. Let the saffrons soak in milk. Boil eggs and deshell it. Make slits on the egg. Add the boiled eggs and saute in low flame. Add turmeric pwd, red chilli pwd, salt and garam masala pwd. Turn off flame and set the eggs aside. In a non-stick vessel or thick bottomed pan, heat oil and ghee. Add cumin, saunf, bay leaf, cinnamon, cardamom, cloves, peppercorns, star anise and saute. Add sliced green chilli and ginger garlic paste. Saute in high flame for a minute. Add sliced onions, salt and saute until onions turn transculent. Add freshly chopped mint and coriander leaves. Add sliced tomato and saute until the tomatoes are cooked soft. Add curd or yoghurt and stir. Add red chilli pwd, garam masala pwd, biryani masala pwd, coriander pwd and combine. Add basmati rice and combine gently with the masala. Add 2 & 1/2 cups of hot water and combine. Cook covered with a lid in high flame for 3 to 4 mins. Fluff gently and turn the flame to low. Cook for another 10 mins. Now fluff the rice gently (see video) and add the spicy roasted eggs. Sprinkle some freshly chopped mint and coriander leaves. Sprinkle fried onions for flavor. Add the saffron soaked milk and a tbsp of ghee. Cover and cook the biryani in low flame for another 5 to 7 mins. Irresistably delicious egg biryani is ready. Serve hot with onion raitha or any curry of your choice.